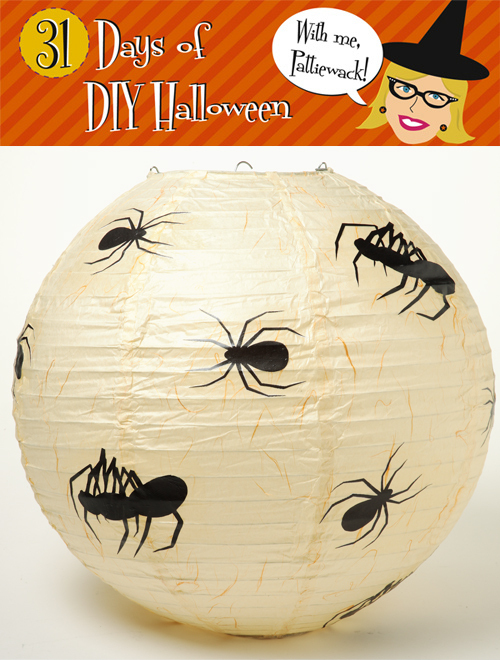 I’m crazy for this creepy crawly paper lantern. And how easy! All it is, is black paper bugs glued to the paper lantern. The perfect last-minute addition to your front porch light on Halloween night, or to slip over all the lamps in the house for a fabulously fast way to decorate in a creepy sort of way. 1. Copy desired number and size of spiders. 2. Cut out each spider on cutting mat, using craft knife. 3. Squeeze out a puddle of Collage Pauge onto a piece of foil. Dip brush in glue and apply on lantern where image will be placed. Immediately, place a spider into glue. Brush Collage Pauge on top of spider. 4. Repeat for all spiders.